This is one of the most common questions we hear from readers. 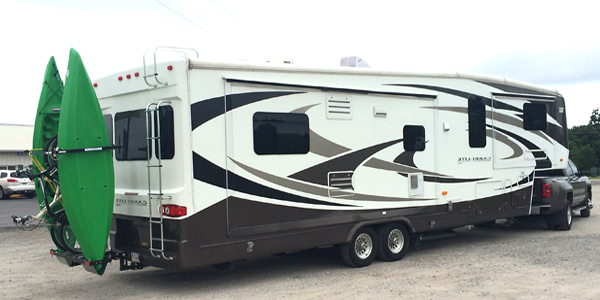 Selecting a truck to pull a Fifth Wheel RV can seem like a daunting task. If you have searched various internet pages then you would have already run into the various terms and calculations that seem to make finding a truck nearly impossible. On this page we have simplified all of the terms and important information in an easy to read format. There are custom tools to make researching and finding a truck easier. 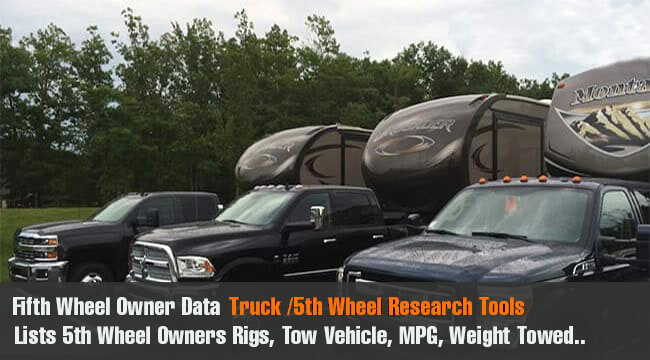 Our Fifth Wheel Owner Data Tool shows 5th wheel makes/models, weights, Miles Per gallon, and which truck brands and sizes are being used to pull these rigs by 5th wheel owners. There is a section showing 6 pre-selected trucks shown that can handle most 29 to 38 foot 5th wheels. Use the Truck Finder Tool to search trucks that can pull Fifth Wheels, and the Tow Calculator shows if a truck is over weight when hitched. Below are the main questions to be asked when looking for a 5th wheel tow vehicle. Things like long bed vs short bed, 4x4 versus 2 Wheel drive, gas or diesel engine, tires and axle ratio are all covered below as well as Gross Axle Weight Rating. Below you will also find information about the maximum payload of a truck and why it is one of the most important weights when selecting a truck for a 5th wheel. In almost every case you will want to tow a Fifth Wheel RV with a long bed truck. Short bed trucks will require a special hitch for the Fifth Wheel due to the decreased turning radius over the bed, which can cause the front of the Fifth Wheel to hit the trucks cab. You are probably going to want to install a truck box in the bed of the truck for extra storage. With a long bed truck this will not be a problem. If you are buying a truck for a Fifth Wheel a long bed is the best investment. Diesel engines can pull larger 5th wheels than gas trucks. Diesel trucks also tend to get better mileage and last longer than gas trucks when pulling an RV. The main feature of having a diesel engine is the low down torque that a diesel engine provides, which makes towing a large Fifth Wheel easier.Our Fifth Wheel Owner Data tool shows that the majority of 5th wheel owners use diesel trucks to pull their rigs. We are asked this question many times. For many people it is a matter of choice as to the brand of truck they prefer and the many options that the trucks are fitted with. Todays trucks are more efficient than ever before and all provide basically the same features, but have different towing and payload capacities. Our Subscribers Fifth Wheel Owner Data tool shows that in 2019 the best truck to pull a Fifth Wheel are Ford trucks. Ford has the best mid-range selection of trucks that have high towing capacities and high payload. There are other brand trucks that have high towing capacities but the payload of the truck cannot handle most Fifth Wheel hitch pin weights, and still provide adequate payload for passengers and cargo without exceding the maximum payload of the truck. You will notice when researching trucks that as the cab size increases, the payload and towing capacity decreases. 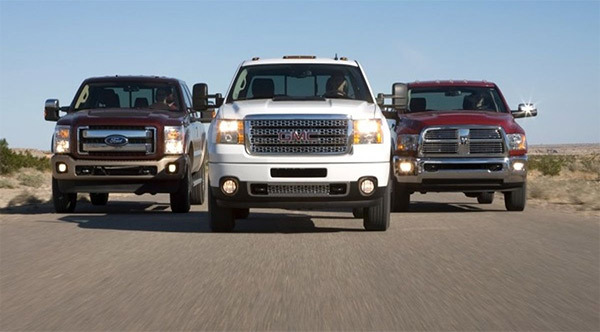 Ford offers crew and super cab trucks that still maintain high payload and towing capacity. Looking at our Fifth Wheel Owner Data tool we see that few 5th wheel owners use dual rear wheel trucks to pull their rigs. Unless you are hauling a rig with a weight over 20,000 lbs a dual rear wheel truck is probably not needed. 4x4 trucks have slightly lower tow and payload capacities, a 4x4 is not necessary when pulling a 5th wheel unless you need the 4x4 capabilites when the truck is unhitched. To select a correctly sized truck to pull your Fifth Wheel, you need to know four critical weights. What is the pin weight or hitch weight of the Fifth Wheel you want to tow - also in the specs for the 5th wheel. What is the maximum payload capacity of the truck - also in the truck specs. If you exceed the towing capacity of the truck you will put excess strain on the engine, the transmission and the brakes. The truck will not perform well pulling the Fifth Wheel and steep inclines could overheat the engine. Driving an overloaded truck is stressful and if an accident were to occur, insurance could be affected by the fact the truck was overloaded. Most people look at the towing capacity of the truck as the critical weight, but the payload of the truck is more important.The truck has to have a payload capacity that can adequately handle the 5th wheel hitch pin weight plus passengers and cargo in the truck.The truck payload is the maximum weight that the truck can safely carry on its axles. The towing capacity is the maximum weight the truck can pull. An overloaded truck is stressful to drive. It perfoms badly on inclines and is slow to accelerate into traffic when merging from a interstate on ramp. As a driver you find yourself speeding up as much as possible down a hill so that you can make it up the other side without losing all your speed. Tongue Weight, Hitch Weight and Pin Weight all refer to the same thing, which is the amount of Fifth Wheel weight that will be pushing down on the axle of the truck. It is an important weight to know, as it affects the trucks payload capacity. The maximum payload of the truck, which will be in the truck specs, includes the driver and any passengers, any cargo loaded into the truck and the Fifth Wheel pin weight. It is important to choose a truck that has a payload capacity for the total weight that will be loaded onto the truck. Take the Gross Vehicle Weight Rating (GVWR) and subtract the Curb Weight of the truck. The Curb Weight is the weight of the truck without cargo or passengers. Both of these weights should always be in the specifications for the truck. For example, if we have a GVWR of 9900 lbs and a curb weight of 6469 lbs then: 9900 minus 6469 will give us a max payload of 3431 lbs. Next we have to take into consideration the weight of passengers in the truck and any other cargo loaded into the truck and deduct that weight from the max payload. After we have a loaded truck (passengers and cargo plus the weight of the fifth wheel hitch / pin weight) our loaded truck weight should not exceed the max. payload for that truck. 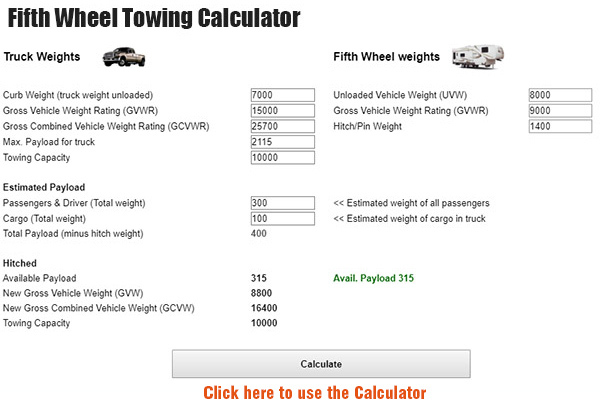 You can use our Towing Weight Calculator to check the weights. When we see these huge Fifth Wheels, one tends to think that the front end weight or hitch weight of the Fifth Wheel must be huge. But most Fifth Wheels hitch weights average around 2,000 lbs or less. The 40 foot Big Horn weighs an impressive 16,000 lbs but the hitch weight is only 2,040 lbs. On average the tongue weight of a 5th wheel trailer is about 20 percent of the gross trailer weight Above we calculated how much we can load onto the truck, which includes one of our most important weights. The weight of the front of the Fifth Wheel. This is the weight that will be pushing down on the rear axle when the Fifth Wheel is hitched to the truck. All tires have various load rating specifications. If the standard tires on the truck are load rated for 3,000 lbs and you replace those rear tires with a tire rated for 3,400 lbs, then you have just increased the payload capacity of the truck by 800 lbs. When the Fifth Wheel is hitched to the truck and the Fifth Wheel is loaded for travel, along with its driver, passengers and fuel, the weight of the loaded truck and the loaded Fifth Wheel should not exceed the Gross Combined Weight Rating (GCWR) shown in the specifications for the truck. 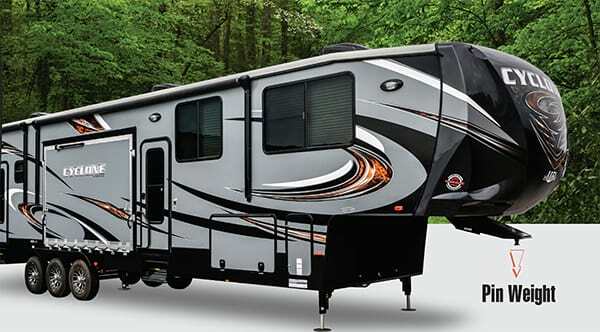 This includes kayaks, bikes and if a trailer is being towed behind the Fifth Wheel. Subscribers have access to the Fifth Wheel Towing Data Research Tool, that shows Fifth Wheel Makes, weights, Miles Per Gallon, Truck Makes and engine type being used to tow by Fifth Wheel owners. 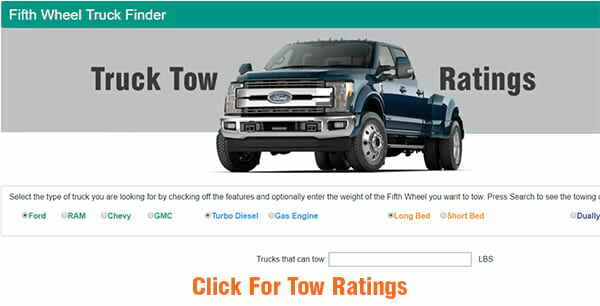 Use this online data tool to find what trucks are being used to tow with, the most popular trucks, 5th Wheels and the MPG they are getting based on the weight of rig they are towing. The tools are available on any internet connected device. If you are at a dealer you can pull up the tools to research a truck or 5th wheel.